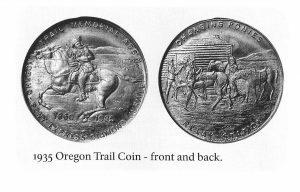 The Diamond Jubilee of the Pony Express was sponsored by the Oregon Trail Memorial Association (OTMA), in cooperation with Boy Scouts of America and local historical associations and communities along the trail. Many celebrations took place between April 3 and October 24, 1935. The highlight of the Jubilee was the August 8-23 rerun from Sacramento to St. Joseph, in which about 300 Boy Scouts participated. They carried letters addressed to President Franklin D. Roosevelt from Governors and other officials along the trail. Some of the Scouts were descendants of original riders. OTMA arranged for an army airplane to fly the mail from St. Joseph to Washington, DC. On August 21 the mail was carried by horseback onto the White House grounds. Dr. Howard Driggs, President of OTMA, and others presented the pouch to the President in a ceremony on the south lawn. Major Arthur Procter served as chairman of OTMA’s Jubilee committee. 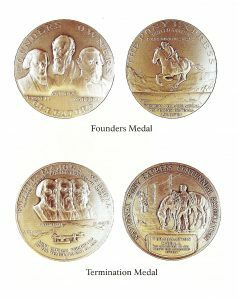 They presented President Roosevelt with the organization’s Diamond Jubilee commemorative medal, designed by OTMA’s secretary, William Henry Jackson, the well-known pioneer photographer and artist of the American West. OTMA sponsored this event as part of its larger, ongoing program to memorialize the Pony Express and to place markers along the route of the trail. By Pony Express from historic old Virginia City we send greetings + best wishes. We hope that everyone here will enjoy the day and have lots of wholesome + joyous fun. To everyone we wish health happiness + prosperity. 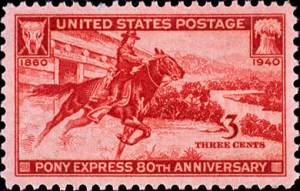 A 3-cent red brown stamp issued on April 3, 1940, commemorated the 80th Anniversary of the founding of the Pony Express, a horse and rider mail delivery system. 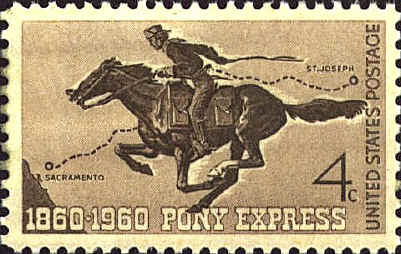 The stamp shows a Pony Express horse and rider leaving a relay station with a load of mail. Most of these riders were teenage boys who loved the thrill of this challenging assignment. 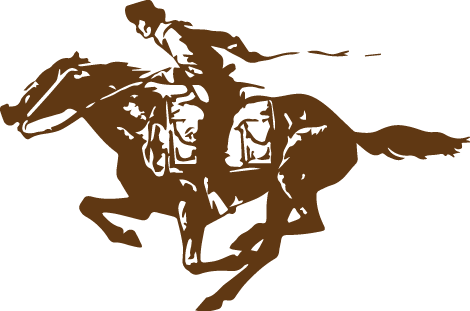 Though short-lived, the Pony Express became one of the enduing legends of the Old West. 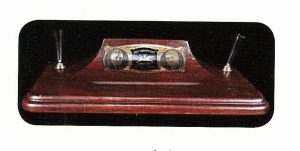 A wooden desk pen set with metal plaque featuring portraits of President Franklin D. Roosevelt and Postmaster General James A. Farley were sent to various postmasters around the country, to commemorate the 80th Anniversary of the Pony Express. 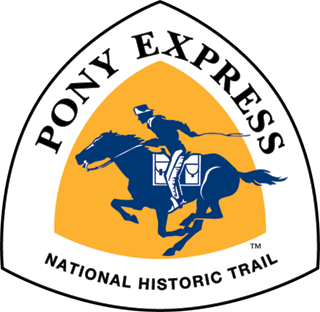 The 1957 Western Governors Conference was the origin of the 1960 Pony Express Centennial Re-ride. Governor Clyde of Utah made the proposal to the eight governors from the Pony Express Trail States of Missouri, Kansas, Nebraska, Colorado, Wyoming, Utah, Nevada and California. Another meeting was held in November of 1957 and the National Pony Express Centennial Association originated at this meeting. President Dwight D Eisenhower agreed to be the Honorary Chairman of this Board. Waddell F. smith was elected President. He was also the great grandson of on the founders, William Bradford Waddell. This committee organized the riders and mounts in the eight states for the reenactment. Riding clubs and other horsemen participated, riding both ways between Sacramento and St. Joseph from July 19 to 28. 1960. So many wanted to rides that each rider was limited to one horse and would only ride from three to five miles. Five hundred riders rode each direction. Patches and Bibles were issued to each rider. President Eisenhower sent letters in the mochila to each of the governors in the eight trail states. A special commemorative stamp was issued and placed on these envelopes. These stamps carried the date of July 19, 1960, the starting date of the re-ride and had a special cancellation stating Russell, Majors and Waddell as founders, owners and operators. Commemorative letters and envelopes were designed and carried across the trail much as it is done today. 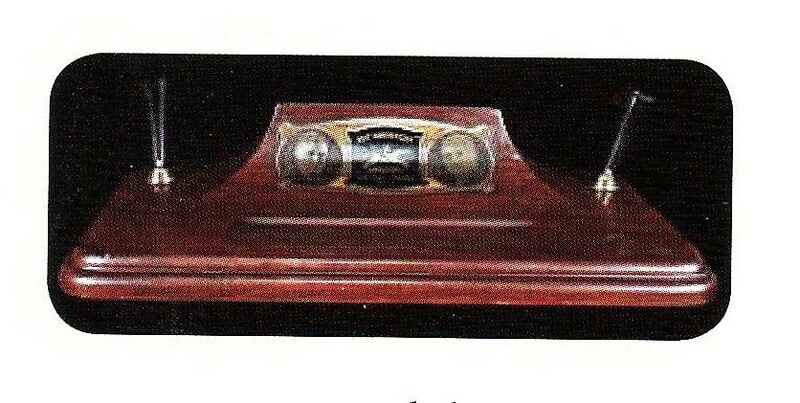 The sale was advertised across America and were sold in advance for $100 each. 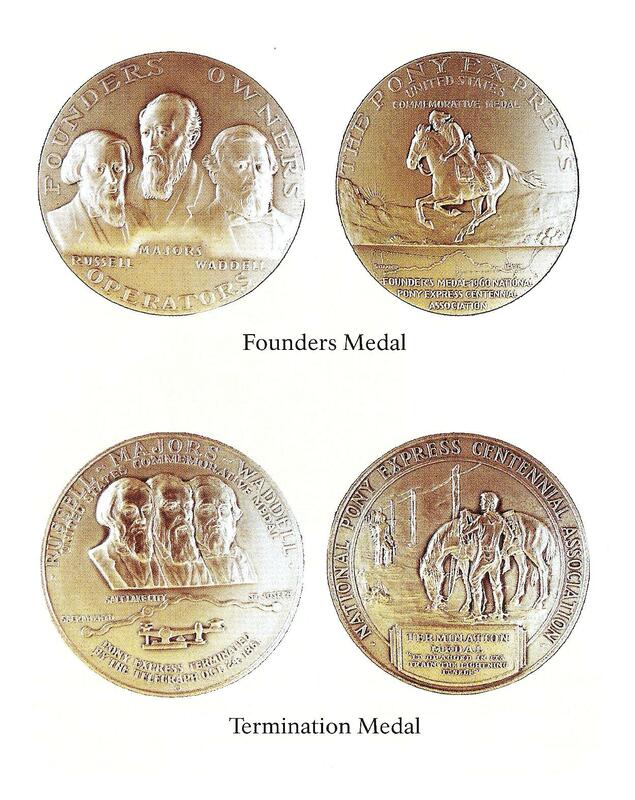 By a special act of Congress, the US Mint in Philadelphia made two large official centennial medals, a Founders Medal and a Termination Medal. 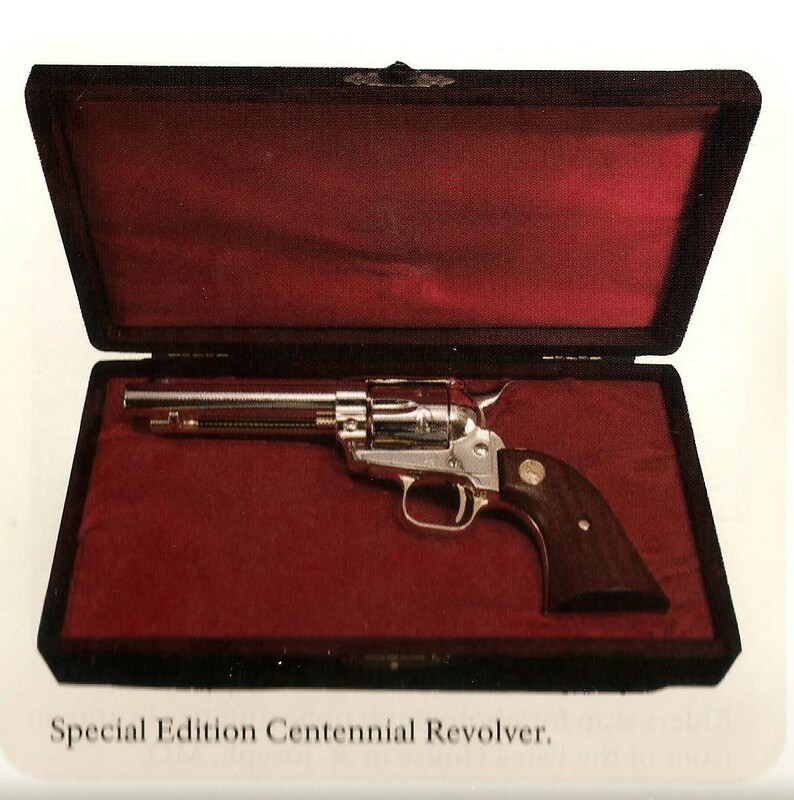 One thousand Colt Special Edition Centennial Revolvers were produced. They were numbered from 1-E (east) through 500-E and 1–W (west) through 500-W to match the numbers of the 1,000 riders. 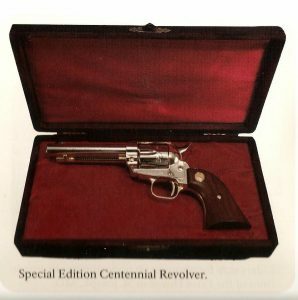 They were offered for sale to the re-enactment riders first and the remainder were sold to the public. The remaining funds were used to memorialize the Pony Express by marking trail sites.